The mats are out, the scales stand by, and the TJ wrestling boys cannot wait for another season of chokeholds and body slams. The cold front has settled in, and it is time for our Spartan winter athletes to blow away the competition. Among these athletes are the fierce and ever-ready TJ wrestling squad. 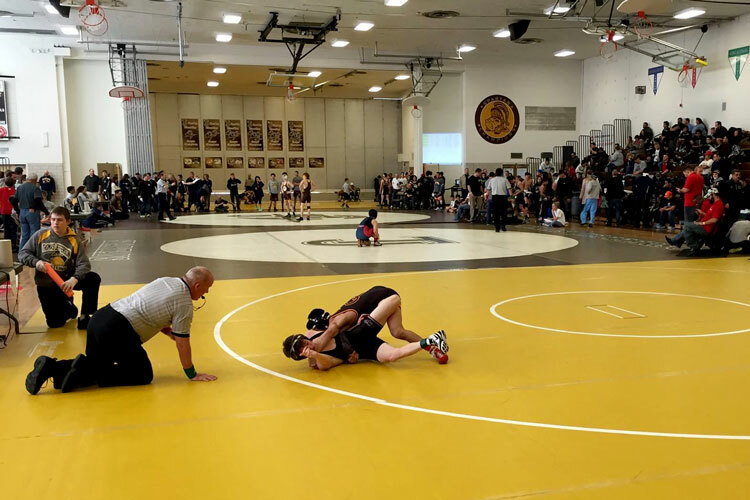 The wrestling squad first stepped onto the mat on Friday, November 11th, and the Dean of Students and Coach Mike Laurita was very animated about the beginning of a new season. “I’m excited for all the new kids,” said Laurita, “as well as the excitement of everything getting started.” This is his 30th year of coaching wrestling, and has previously led Thomas Jefferson wrestlers to six consecutive league titles, and brought 57 kids to state and other championships. Assistant coach Layth Dieyleh was a superb wrestler for TJ just a few years ago, graduating in 2013. During his senior season he amounted 48 wins, making it the school’s single season record, as well as contributing to TJ’s league title wins. Laurita predicted that this year, sophomore Bobby Macias is ready to compete at the state level. “I love going live [with other wrestlers].” stated Macias “It shows where you are with another wrestler.” Along with Macias, wrestlers such as sophomore Sam Cole and junior Jamaal Gaines were mentioned by Laurita as up-and-coming competitors. For these athletes and their coaches, wrestling represents strength of both mind and body; it gives competitors the attitude to confront competitors life with a new strength. “It teaches many life lessons,” Laurita said. “Things you have to do to wrestle, it can carry you a long way in life.” Similar thoughts are shared by his wrestlers as well. “I wanted a new way to gain some of the toughness I wanted,” Cole mentioned. “I also wanted to gain that mental attitude that would help me in life.” With that in mind, the TJ wrestling squad is fired up and ready for a new year of takedowns and tournaments. Wish the Spartan wrestlers luck on their journey through this new season!